At EDS 2000, CortecR Spray Technologies Division is launching over 100 new Rawn America T Brand products, which include new packaging and new delivery systems. 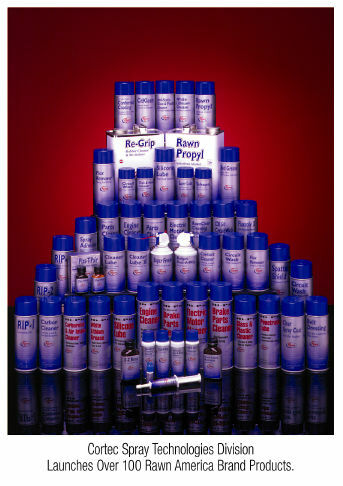 During its 40 years in business, Rawn has launched numerous new chemical and application technologies. The 1999 -2000 year has been especially abundant. Most recently, the company won "Product of the Year" award for its newest product line dubbed, "Eco Air", which is the most innovative spray technology known today. It's powered by air. From the smallest circuit board to large electrical power grids, the new EcoAirT line of products out-perform traditional aerosol petroleum-based products with environmentally safe systems that eliminate costly waste disposal. EcoAir's new air compressed technology is propelled by air-power compressed in an Eco PouchT; the spray is non-flammable and non-combustible. "For the first time in our industry, aerosol products will be powered by air instead of traditional petroleum based propellants," says, Oleh Artym, Cortec's Marketing Communications Director. The new EcoAir line cleans, preserves and safeguards against oxidation. In addition to these products, Rawn America Brand will also introduce a complete new line of traditional no-residue cleaners, degreasers, and lubricants as well as a line of revolutionary new Soya (soybean) based products. Recently, Rawn became part of Cortec Corporation. Rawn's business goals and Cortec's business goals were similar. They are to maintain a highly focused interaction with their key distributors in the process, electronic/electrical and maintenance markets. The company's focus is on providing high quality and innovative products. Rawn's integration into Cortec Corporation solidifies a strong union of chemical labs and aerosol production. The result has been competitively priced chemical solutions for industrial and commercial markets. By combining Cortec's strong lab of Ph.D. chemists and experience in chemical applications with Rawn America Brand aerosol filling capabilities, products are developed from start to finish by professionals. Rawn America branded products have also adopted many of Cortec's ISO 9001 and 14001 criteria standards, which reflect a dedication to quality and environmentally safe systems. Cortec's investment into plant upgrades and laboratory research places them in the forefront of high tech chemical solutions companies. They are developing high-performance, multi-functional products for day-to-day maintenance and clean-up chores. Rawn America Brand non-flammable Anti-Static Glass & Plastic Cleaner, Plas-T-Pair, Rubber Revitalizer and Dust-A-Way powers up MRO operations with peak efficiency. From thin screen computer monitors and video equipment to the latest in telecommunications components, the new hi-tech products are expanding the performance envelope. Today, the Rawn America Brand also leads with a new approach to a traditional market. It offers products with low environmental impact and the same or better performance over conventional petroleum based products. The commercial and industrial sectors are starting to show considerable interest for re-engineered "environmentally low impact" cleaners over traditional chemicals with older petroleum-based formulations. Today's escalating cost of oil coupled with EPA restrictions on waste disposal are heightening everyone's commitment to the environment. OSHA is setting more stringent PELS, (Permissible Exposure Limits) in the workplace for hazardous chemicals and the US Consumer Product Safety Commission is quicker to foster product recalls. Their purpose is to eliminate the serious risks to human exposure to many of these adverse environmental effects. As user conscientiousness grows, a diet of hazardous chemicals, with a spray and breathe-in-effect, will be harder and harder to swallow. Since Cortec has acquired Rawn the focus has been to re-engineer chemical formulations into "green" products for the earth's sake. Cortec has demonstrated an industry commitment toward developing and researching cutting edge, Eco-safe products that are organic, non-toxic and recyclable. Cortec's total dedication toward developing safe products and assisting other companies in reducing their impact on the environment resulted in Cortec Corporation becoming the second US company to receive ISO 14001 certification. As the largest manufacturer of the breakthrough VpCI, Vapor Corrosion Inhibiting technology, Cortec is a world leader in total corrosion control. Their newest product line introduces a water-based chemical technology that enhances the performance of electronic and electrical components by sealing metals against corroding elements.